I get a lot of Bible and theology questions sent in to me from that sidebar section on the right. I try to respond to as many of them as I can. 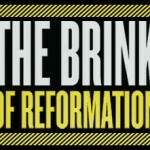 This post deals with questions about being in Christ, getting forgiveness from God, and how the Reformation didn’t reform much.